Alec Baldwin returns, but this time it’s not as Trump. It’s as a baby. (So actually, still close enough). 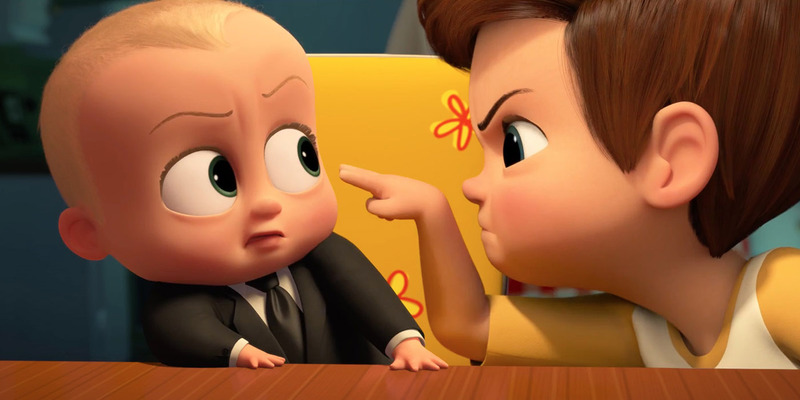 Based on Marla Frazee’s picture book of the same name, The Boss Baby is brought to the screen by screenwriter Michael McCullers and director Tom McGrath. Tim (voiced by Miles Christopher Bakshi) is living the perfect life as an only child. His parents (Lisa Kudrow and Jimmy Kimmel) are enthusiastic participants in the games he conjures up with his active imagination, and have all the time in the world for him. Then the new baby comes along. In a taxi. Suddenly, Tim is no longer their priority; his parents are at the mercy of the new boss. One night when Tim’s parents have passed out on the couch from exhaustion he hears something in the baby’s room. Upon entering he discovers the horrifying truth: not only can The Boss Baby (Alec Baldwin) talk, he was sent on business from Baby Corp., an organisation in the sky which sends babies down one of two paths – to a family, or to corporate. If he succeeds in his undercover mission, he can return and get a promotion. With Tim desperate to retain the status quo of only child life, and TBB desperate for his promotion, they figure out what they need to do: convince Tim’s parents that they love each other. While the clear message of The Boss Baby is that children can learn to accept and love their younger siblings despite initial reservations, it is also essentially about the power of a child’s imagination. Tim whispers to TBB the story his parents told him about how babies are made, but tosses that apparently ludicrous explanation aside, instead opting to believe in the Baby Corp. organisation in the sky. One early scene demonstrating the production line of babies – with TBB amidst the pack – is thoroughly enjoyable, and will no doubt elicit many laughs from younger audiences. The narrative that follows is somewhat ridiculous, but that’s really fair enough considering it’s all coming from the mind of a seven year old. Where the film falters is in its follow-through; the resolution, while certainly sweet, doesn’t quite clarify the reality of the situation. Such a criticism is probably only relevant to adult viewers, but it seems unusual that for a film that looks like it’s trying hard to please this demographic, it would let them down in this way. And by that, I mean that it was almost an absolute triumph until they stuffed up the ending. Kids, on the other hand, will most likely take the whole film at face value, and will enjoy what’s offered. There are plenty of sight gags featuring both babies’ and puppies’ bottoms which are likely to produce endless giggles. Many of TBB’s remarks will go over kids’ heads, but his facial expressions combined with Baldwin’s dry delivery will probably entertain them nonetheless. At a fast-paced ninety-seven minutes the film should hold kids’ interest with its vibrant animation and plentiful action. Of course DreamWorks still languishes far behind the behemoth animation studio of Pixar, but it’s gradually heading in the right direction.